Stephan Baby's beautiful Keepsake Bible truly honors the lovely custom of presenting a small Bible as a baby gift which, someday, will become a treasured part of a bridal bouquet. 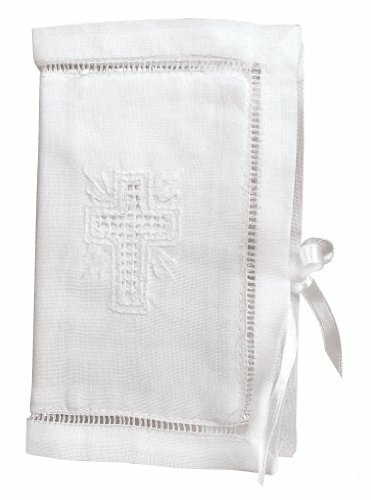 The petite King James New Testament measures approximately 4-1/2 x 6-1/2" and is presented inside a snowy white 100% cotton cover embellished with an embroidered cross, openwork details and a ribbon-tie closure. If you're thinking that a Stephan Baby Keepsake Bible would make a wonderful shower gift, you'll be delighted to find that it arrives in a window gift box and includes a poem about the tradition of Keepsake Bibles. Since 1987, Stephan Baby has been dedicated to fine quality, unique and heartwarming gifts that celebrate the magic of baby's first year. The Stephan Baby family invites you to discover their inspired collections of blankets, gift sets, charming apparel and accessories, beautiful keepsakes and oh-so-huggable plush animals, available on Amazon. All Stephan Baby products are CPSIA tested and approved. Stephan Baby Keepsake Bible with Embroidered Cover; Bible measures approximately 4-1/2 x 6-1/2"
If you have any questions about this product by Stephan Baby, contact us by completing and submitting the form below. If you are looking for a specif part number, please include it with your message.